Kathryn Joan McDonald, daughter of Loraine Anthony McDonald and Frances Philomena Selker, married Jack Barr on November 18, 1950. 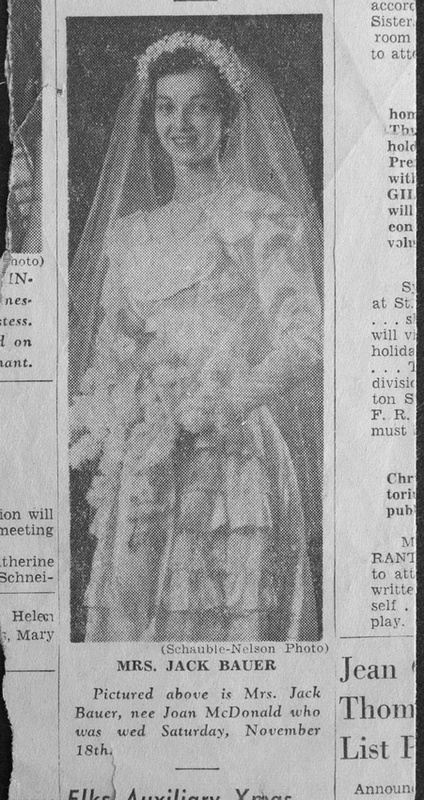 A copy of their wedding announcement in the Erie Daily Times was included with her mother's photo collection. The newspaper page number is unknown. From the Frances Philomena Selker Collection. Editing and digital restoration by Michelle M. Murosky. Kathryn Joan McDonald is my great-aunt. She is the sister of Mary Eugenia McDonald my paternal grandmother. Cabinet Card: Leopold George Selker, Jr.